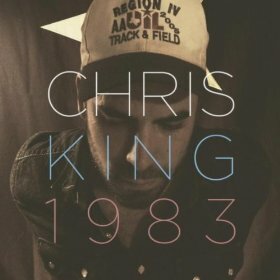 Two songs into his full-length debut album 1983, country singer-songwriter Chris King delivers a lyrical face-slap to the “me” generation: “Maybe if I was a modern man/Things would fall right into my hands/I wouldn’t ever have to think about anybody but myself,” he muses in “Native Son.” The rebuke is delivered with enough charm to alleviate the sting, and highlights the sharp, plain-spoken observations that often flow from King’s pen. Such candor is to be expected from King, a Texas traditionalist who first revealed his blunt assessments on two previous EPs, 2009’s This New Almanac and 2010’s Bexar County.The conversational tone of those recordings is also present in 1983, an album that possesses the type of swagger an artist gains not from arrogance, but security in himself and the knowledge of his own truths. At his best, King’s matter-of-fact recollections of regret, romantic woes, and pride pack a musical gut-punch. As with his previous work, a strong cast of supporting musicians including Scott Davis, Cody Foote, Geoff Queen, Kevin Szymanski, and Sweeney Tidball add new textures to King’s songwriting . Producer John Ross Silva combines the talents of his players to craft a rambling album that can be played alongside those of honky-tonk heroes from the past, present, and future. Friends and collaborators Jamie Wilson and Kelley Mickwee of the Trishas provide gorgeous harmonies while prominent steel guitar by Davis and Queen infuses the album with both energy and a sense of melancholy. Rather than relegating the instrument to the background or including it as an afterthought, the steel guitar proves as essential to the record as blood coursing through a body. 1983 is book-ended by two love songs: opening number “Twenty-Eight” is a laurel to the state, people, and values that ground him while closer “Something Less Formal” recounts sleepless nights spent pondering the possibility of the new relationship. Both offer insight into King’s complexities. Despite an attempt to leave his stomping grounds behind in “Twenty-Eight,” King retains ties to his roots, acknowledging that “My regrets are far and few between/And I can’t say that they cost me a thing/’Cept some money and a little bit of love.” That conviction fuels the confessions later made in “Something Less Formal.” King professes to a potential new love “I swear I find you fascinating/I swear that’s uncommon for me/And I know I’m a little naive/But I believe that’s a good way to be.” The kind of naked admission would be impossible without the emphasis he places on the importance of family, chivalry, and independence in “Twenty-Eight.” revealing how King’s past continues to shape his character. King’s honesty informs much of 1983. As an artist, he never pens neat, tidy ditties that result in fairy tale endings. Instead, he probes his own history, resulting in compositions that range from the expression of unrequited feelings in “Homeland” (“In my homeland I am well-known/but out here I’m nobody to you”) to the blues-tinged heartache of “I’ve Been Dying.” Nonetheless, listeners shouldn’t mistake 1983 as an album devoid of hope. Ultimately, 1983 is only the first chapter of an unfinished life. Not coincidentally, the final words that echo in “Something Less Formal” are “I believe…” hinting at the promise of stories yet to be told.